Well Halloween soared in on bat wings and then quickly went. I think it's time I shared some of our October/Halloween happenings here at the Peahed Pad. One of the highlights of the month was when the grandparents came to visit from Hawaii. 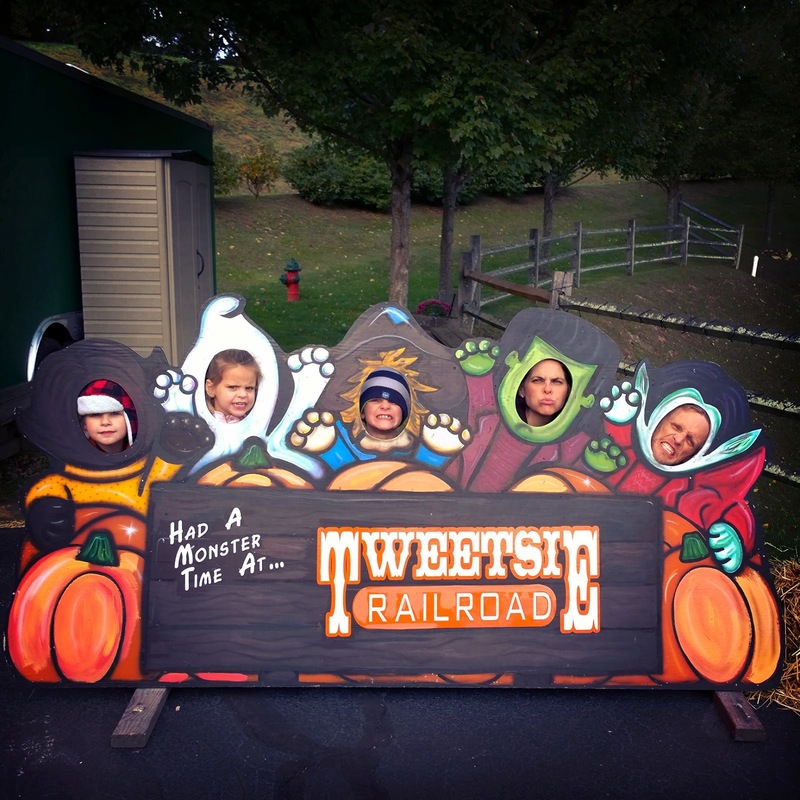 They took us to stay in Blowing Rock, NC where we got to visit Tweetsie Railroad. 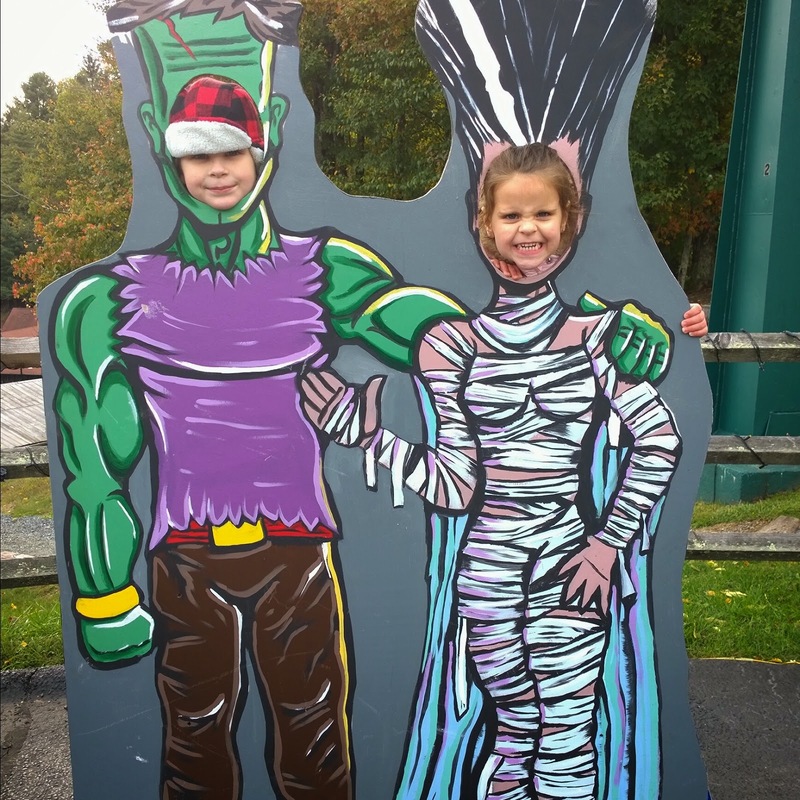 My Frankenstein is pretty cute but look at that Mummy! Yikes! A group photo was definitely in order when we spotted this 5 monster wooden sign. We threw a fun Halloween party near the end of the month. 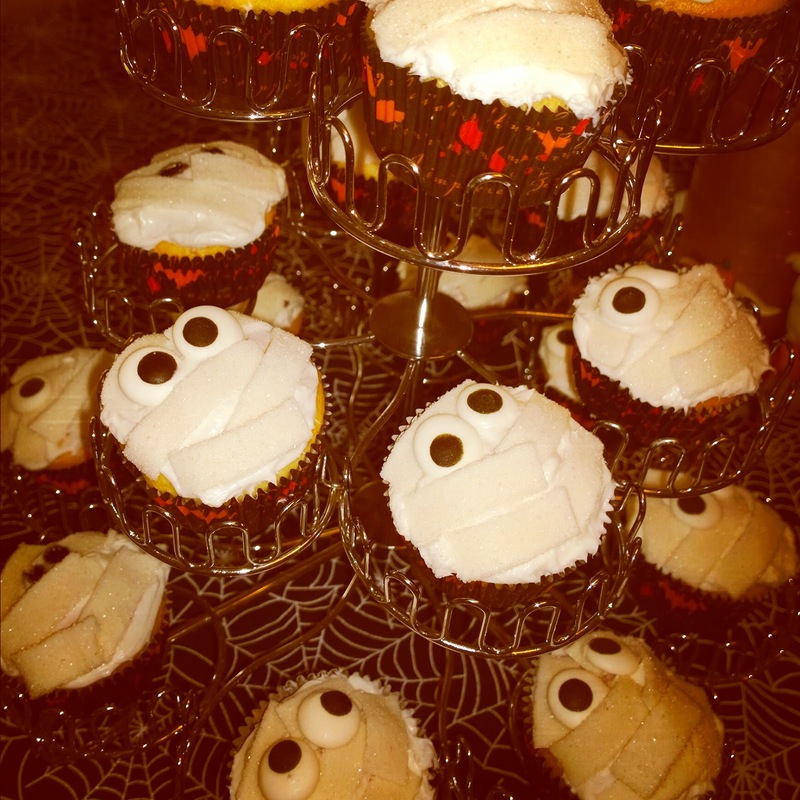 The mummy cupcakes turned out so cute. And then they reminded me of Rockwell's Song "I always feel like somebody's watching me." I wish I got a shot of my sugar cookies when they were fully decorated, but I did manage to take some after the first layer of frosting! 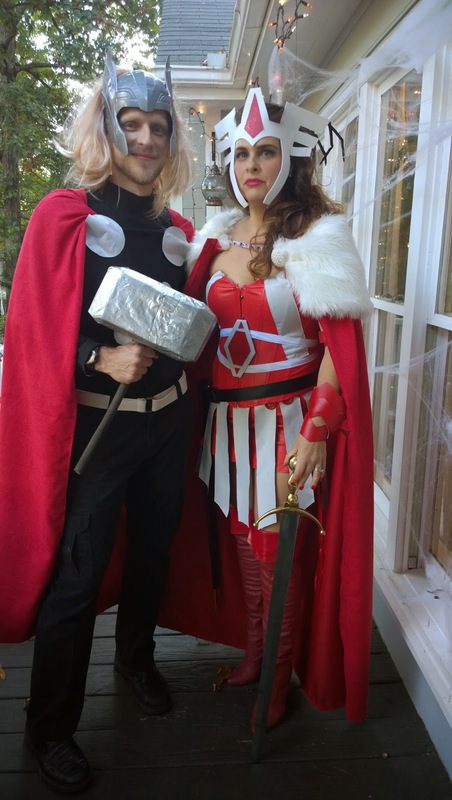 Our family did a Halloween family theme as the Avengers. I was Lady Sif, Joe was Thor and the kids were Captain America, Iron Man, and Spider Man. For details on the costumes see below. Another picture I should have taken during a different time! This pizza was awesome as an eye-ball. My neighbor Jodie brings two eye ball pizzas every year. They are always a hit. Our drink this year was "Zombie Blood." It consisted of equal parts cranberry juice, pineapple juice, 7-Up and Coconut Rum. It was very good! Another drink that turned out yummy was the slow cooker pumpkin latte. You can find the recipe here. I was able to snap a pic of the mantel this Halloween. The owl lights were new from last year's Halloween sales. The disco ball is always fun so we left that up from Emmeline's birthday party. 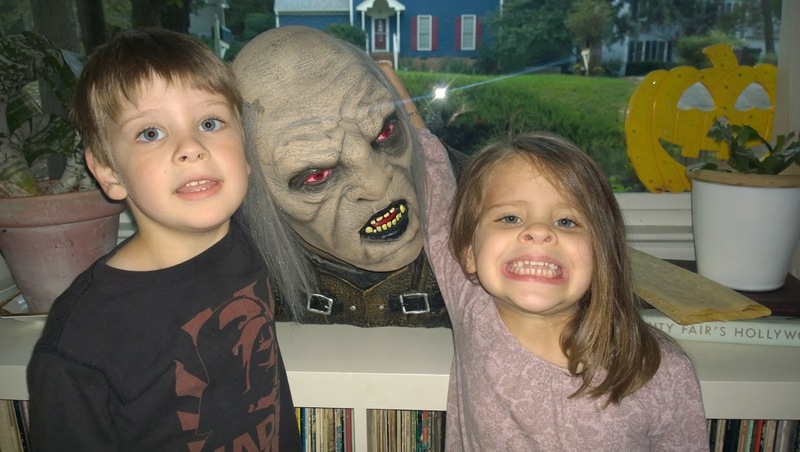 I snatched up this scary Orc from The Goodwill for $20 bones about three years ago. It has become part of the family. As promised here are the details of my Lady Sif costume. My headpiece was hand crafted from a piece of white and red foam from Michaels. Joe used an exacto knife and a compass to get the sides even. I hot glued a piece of elastic to hold it in place. 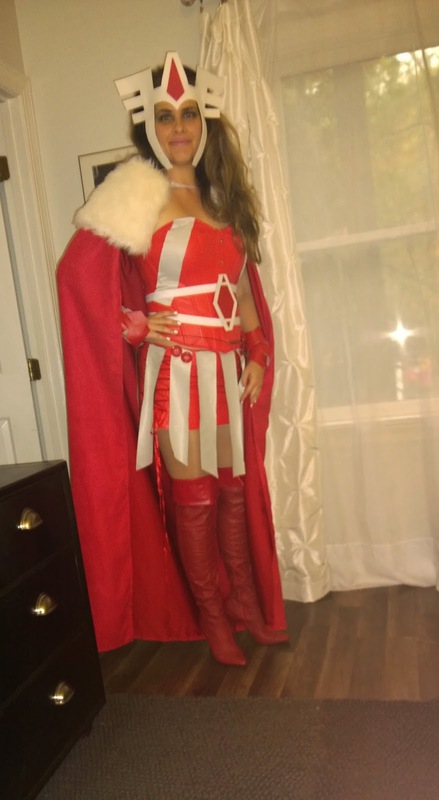 I used 3 yards of red velour fabric for the cape and safety pinned it to a white fur wrap I found on Ebay. For my outfit, I bought a red leather corset and skirt combo on ebay for around $15. I used light gray costume fabric to sew the pieces on the skirt and corset. The belt was made using a piece of cardboard wrapped in the red vinyl I used for the arm peices. White hem tape was used for the two belt pieces. I found black leather cording for an additional belt with antique Czechoslovakiann beads I also found on Ebay for $10. The boots were an ebay find for $35. Not pictured is my sword I found on Ebay. For Joe's Thor costume I sewed the cape from the same cut of Velour Fabric. He cut out 6 circles of varying sizes and taped them to a basic black shirt. His wig and Thor mask came from a costume shop. His hammer was constructed from a foam block and stick we had on hand. He painted it with gray paint and some oil rubbed bronze spray paint speckled on top. His costume cost about $40 to assemble. Hope everyone had a Happy Halloween! Now we have to start planning for next year!